I am an operations staff astronomer at the European Southern Observatory (ESO) in Chile. I work mainly with ESOs Very Large Telescope Interferometer, the largest optical interferometer and telescope in the world. In particular, I am the Instrument Scientist for the K band interferometer GRAVITY, which combines four telescopes to perform phase referenced imaging and narrow angle astrometry. 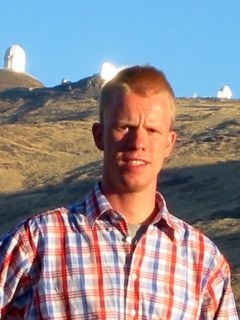 My research is focussed on the investi­gation of active galactic nuclei using obser­vations with high angular resolution at infrared and sub-mm wavelengths. Active galactic nuclei are the very luminous centres of galaxies which are powered by the accretion of matter onto a super­massive black hole. I am in particular interested in the properties and the physics of the molecular gas and warm dust which surround the central engine of the active nucleus, that is, the super­massive black hole and its accretion disk. This dust and gas is the reservoir for fuelling the black hole and, depending on its distribution, it may hide the central engine. For my investigations I use infrared photometry, spectroscopy and interferometry. Most of all, I used the MIDI instrument at the Very Large Telescope Interferometer, which is part of the Paranal Observatory in Chile. For more details, take a look at my research page. © 2005-2019 Konrad R. W. Tristram	 Last modified: 30/07/2018, 18:13.